Bringing to the earnest learner of Greek, whether at the beginning, advanced, or professional level, the authentic sounds of Greek. 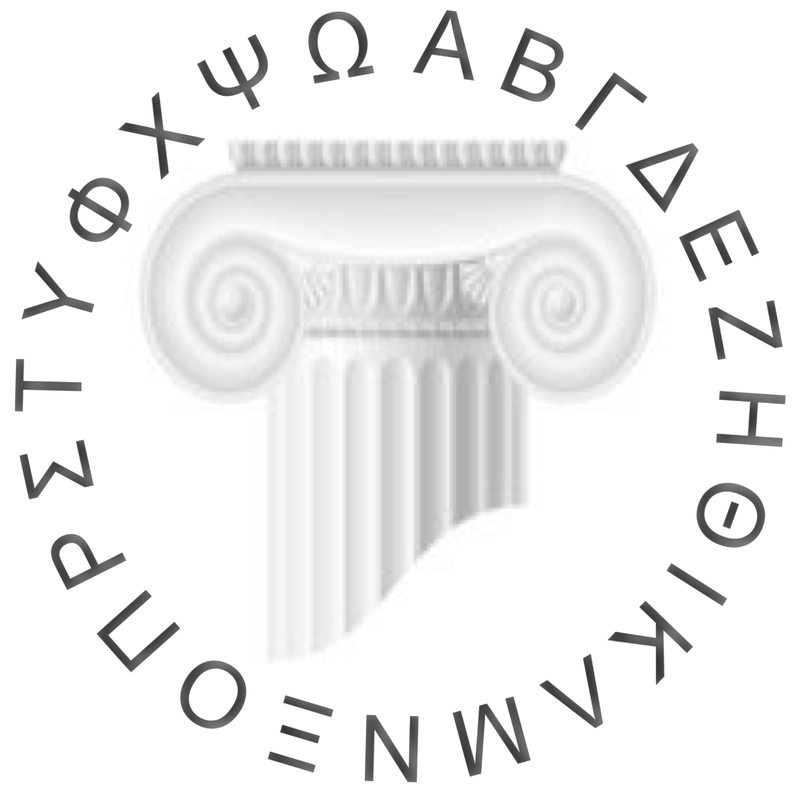 Provide learning tools for reading, pronouncing, and comprehending Greek (Vol. II & Vol. III). In his VOX GRAECA: The Pronunciation of Classical Greek, today’s leading Erasmian pronunciation author, W. Sidney Allen, makes certain claims about Greek phonology that are as un-Greek as the Latin title of his book. Read this critical excerpt from Vol. I. Concise, Clear, Revealing. Written for Students and Scholars. 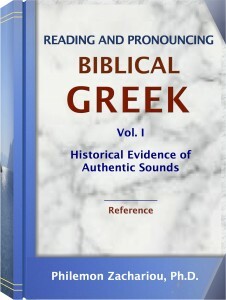 This book— •Dismisses misconceptions about the manner in which letters and digraphs are read and pronounced in Neohellenic (Modern Greek); •Shows the historical evidence in favor of the Neohellenic pronunciation of Koine; •Explains the origins and defines the formation of the Historical Greek Pronunciation (HGP); •Gives an account of the origins and spread of Erasmian; •Refutes Erasmian theories regarding Attic and Koine sounds; •Exposes the artificialities and inconsistencies of Erasmian and the force that sustains it; •Describes the damaging effects Erasmian has had on Greek scholarship and learning; •Demonstrates how the HGP, preserved in Neohellenic, can help in the area of textual criticism and textual transmission; •Shows that a full diachronic and holistic approach to the Hellenic language and literature can contribute to the exegesis of the NT text. 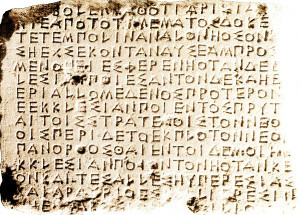 The appendixes lend support to the historicity and diachrony of the historical sounds of Greek by examining a number of Classical Attic decrees (courtesy of the Epigraphical Museum in Athens). VIDEO 1 is based on Vol. I. To order Vol. I through PAYPAL, forward $27 to NTGreek@att.net. FREE SHIPMENT within the continental US. Outside of USA buyers, please add $14 (per book) for partial cost of shipment. 8.5” x 11” spiral-bound, 8 chapters, 173 pages. “I am glad that you have written this book and I congratulate you. I am sure it is needed in America. I think, therefore, that your book ought to find a market and quite a few readers should profit from its fine presentation with excellent examples illustrating the discussion. This should prove an indispensable textbook for seminaries and colleges teaching NT Greek.” —Dr. Chrys C. Caragounis, professor of New Testament exegesis at Lund University, Sweden (author of The Development of Greek and the New Testament: Morphology, Syntax, Phonology, and Textual Transmission). 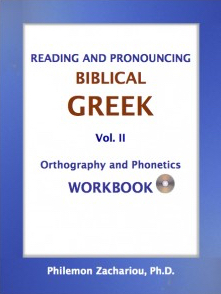 This Workbook serves as a reading, writing, listening, and pronouncing guide to Biblical Greek as well as Neohellenic (Modern Greek). It may be used as supplementary material in a college course, homeschool setting, or self-directed study. It includes written exercises, tests, answer keys, and audiovisual drills and reading passages that are also on the CD. 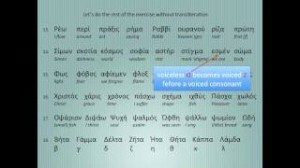 The exercises and sound files will prove helpful to those accustomed to other (non-Greek) methods of pronouncing Greek. VIDEO 2 is based on Vol. II. To order Vol. II through PAYPAL, forward $24 to NTGreek@att.net. FREE SHIPMENT within the continental US. Outside of USA buyers, please add $13 (per book) for partial cost of shipment. 8.5” x 11” spiral-bound, 7 chapters, 79 pages. CD 16 files, 1.10 hrs. Grammar Essentials will benefit the mid-beginning and intermediate student of Greek as well as the advanced seminarian and can be used as a resource by the professional. An all-in-one grammar book, pronunciation guide, and workbook featuring transliterated exercises, grammatical aspect, and translational insights, Grammar Essentials is a select collection of lessons I have shared with learners of Greek over many years. A companion CD goes with select reading exercises. To order Vol. III through PAYPAL, forward $29 to NTGreek@att.net. FREE SHIPMENT within the continental US. Outside of USA buyers, please add $15.00 (per book) for partial cost of shipment. 8.5″ x 11” spiral-bound, 15 chapters, 250 pages. CD 16 files, 28 minutes. Order Vol. I and Vol. II as a bundle for $38 (save over 25%). FREE SHIPMENT. Forward amount to NTGreek@att.net through PAYPAL. Offer within the continental US only. The reading in this video is intentionally slow in the beginning, then progressively approximates conversational speed, all along allowing the reader to practice repeating the parts being read. VIDEO 4 Reading and Pronunciation Tips (1.46 min.). A very short video with tips for reading Greek. This video, like Video 3, read at a slow-to-moderate speed, enables you to practice reading, listening, and pronouncing Greek using the Neohellenic (Modern Greek) pronunciation. 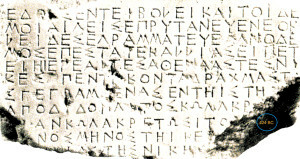 Neohellenic preserves the historical sounds of Greek, so its pronunciation comes very close to the pronunciation of the Κοινή “koine” of the New Testament. The evidence of the historical Greek sounds, collectively referred to as the Historical Greek Pronunciation (HGP), is discussed in Vol. I (above). A Greek pronunciation exercise using the statement of faith adhered to by Christians of all denominations. The Nicene Creed, ΤΟ ΠΙΣΤΕΥΩ “The I Believe,” was originally written in Nicaea in AD 325. The PROSELYTIZER (2011) — From Asia Minor to Crete, Greece. This book is the record of a man’s deeds, thoughts, and motives as he captured them with his pen first, as a refugee teenager, then as a worldly young man, later as a growing Christian, and finally as a minister of the gospel. This gripping account portrays an energetic young man in quest for meaning in life but who, in utter despair, turns suicidal. Miraculously spared from the “claws of Death,” he seeks God and becomes inwardly transformed. Eager to reach his fellow citizens with the message of Christ, he learns unconditional obedience to God as he witnesses divine intervention during business failures, poverty, war, captivity in a German concentration camp, mass execution, hardship, persecution by religious leaders and the authorities, false accusations of proselytizing with gifts and money, and repeated imprisonment for sharing the gospel. A legacy of faithful Christian service, this true story will touch you, encourage you, and uplift you. Foreword by Everett Stenhouse and Glen D. Cole. iPad, iPod touch, iPhone – iTunes click HERE. Kindle, Mac, PC, etc. –AMAZON click HERE. For a hard copy through PAYPAL, please forward $10 to NTGreek@att.net (FREE SHIPMENT within the continental US.) 20 chapters, 290 pages. 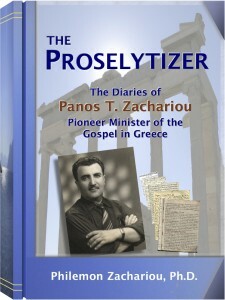 Read the book shown above (The PROSELYTIZER) in Greek with the title Το ΑΠΑΓΟΡΕΥΜΕΝΟ ΒΙΒΛΙΟ: Η Ζωή μου Πριν και Μετά The FORBIDDEN BOOK: My Life Before and After. For a paperback copy, send a note to NTGreek@att.net. About the author : Philemon “Phil” Zachariou graduated from high school in Greece and from a Bible school in England, and holds a B.A. and M.A. in applied linguistics and a Ph.D. in religious education. Retired, he writes and teaches Greek and English. During most of his career as an educator and public school administrator he taught, among other college subjects, Greek at California State University, the Golden Gate Baptist Theological Seminary, Adult Education, and Capital Bible College. He currently teaches English at Northwest University, and New Testament Greek for BibleMesh Institute.